That is the top of my head. Why am I showing you the top of my head? To make a point about the love of my (hair) life, Terax. You see, I am Sandra Bullock brunette and Mariah Carey curly. 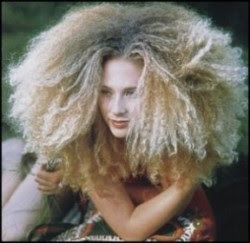 I alter that little issue though with twice-weekly blowouts and bi-monthly bleaching. 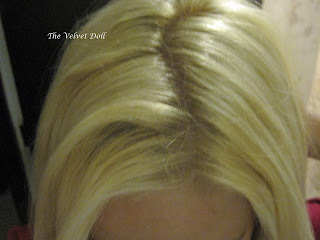 The process works (see above picture), but is VERY hard on my poor mistreated hair. 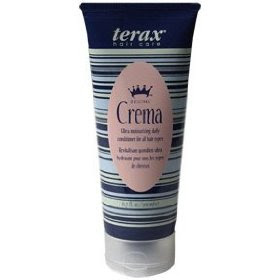 Thank goodness for Terax's Crema. My hair was seriously falling out before a friend who also had been dealing with frizzy/curly hair all of her life suggested that I try it. That was in 2005 and my hair looks 100% better. Terax Crema alters the pH level of your hair, making it almost immediately feel and look healthier. It is the most amazing hair product out there. I put it on in the shower, shave and exfoliate and then rinse. Somehow in that 5 to 10 minutes that it sits on my head it works wonders. Terax is not easy to find always - in Kansas City only a handful of salons carry it. I normally purchase it off eBay. The price of Crema ranges from $16 to around $40 depending on what size you purchase. "...to keep my hair from looking like this..."